“They said I could be anything, so I became a rocketship.” - this Supercar, probably. James Moffat’s No. 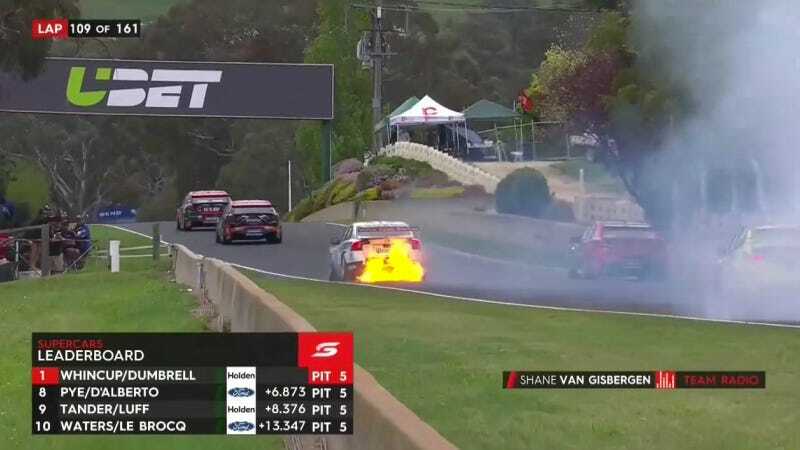 34 Volvo had an unexpected engine failure that resulted in a big engine fire on lap 109 of today’s Bathurst 1000. One consequence worth noting is that Supercar teams with two cars really, really try to avoid stacking one car behind the other in the pits. Each car doesn’t have its own pit crew. Teams’ cars share one stall on pit lane. Shane Van Gisbergen was running comfortably in second place when Moffat’s spectacular failure brought out a safety car. However, the Red Bull Racing team opted to stack Van Gisbergen behind the car of Jamie Whincup when they cycled everyone through the pits. While this opportunity for an easy pit stop under yellow-flag (read: slower lap) conditions alleviated concerns over whether or not cars would have enough fuel to go to the end of the race, Red Bull’s decision to pit both its cars at once dropped Van Gisbergen all the way down to 11th place. This race started off uncharacteristically incident-free, then turned to chaos with multiple on-track incidents starting with Andrew Jones’ wall smack on lap 92, and with the latest safety car due to the No. 3 car getting stranded out on track. Now on lap 119, Chaz Mostert’s No. 55 car crawled into the pits with a mechanical issue out of fourth place. This is perhaps the unhappiest face I’ve ever seen peek out through a helmet. Bathurst is brutal on cars: fact. Expect more carnage as the race wraps up.